Is Your Pet Prepared for a Disaster? It’s been 4 years since Superstorm Sandy battered its way through the northeast. I started the day at work as usual with plenty of sick animals to go around. By noon, major roads were starting to close, states of emergency were being declared and my path back to the safety of home was quickly being drowned out of existence. We closed the office early, knowing there were several good 24 hour facilities for the pets in need of true emergency care, and everyone else should be staying safely off the roads. I lived in an evacuation zone so I headed to my parent’s house, pets in tow, where I safely weathered the storm. The next morning, driving through the streets back to my place to check on the damage, it was amazing how one street was devastated and the next looked just fine. I was lucky—not just because the massive costal-flooding missed me by half a block or because I didn’t lose electricity. I was lucky because I had a safe, pet friendly place to go during the storm. Not everyone else fared so well. People went weeks without electricity or heat. Many lost their homes completely. At least 117 people lost their lives. And many people lost their pets. Tens of thousands of animals were displaced, abandoned or injured. This is all too common during disasters like hurricanes, earthquakes, wildfires and blizzards. Even smaller scale emergencies like house fires can be devastating for pets. September is National Disaster Preparedness Month. In its honor, here are some tips to keep your furry family members safe. Have a list of kennels/vets with phone numbers that you might be able to board your pet at. 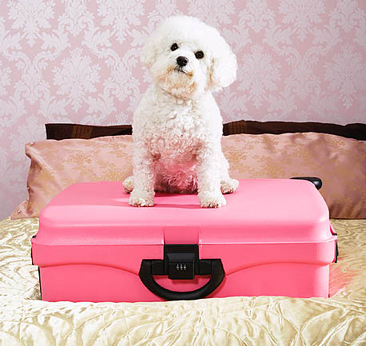 Prepare a list of pet-friendly hotels that are along your planned evacuation route. Check with your local animal shelter to see if they have emergency resources for pets. If your pet is lost or displaced during an emergency, you want to make it easy to be reunited. Make sure your pet is wearing a collar with identifying tags as well as your contact info. Since collars can come off, it’s also important to make sure your pet is microchipped and that the microchip is properly registered. There’s always a run on the supermarket for milk and bread when a storm is coming, but did you hit the pet store too? Here’s what you should have at the ready for your pet if an emergency hits in addition to your standard emergency kit. Pet Food and Water- Keep at least 3-5 days worth of dry or canned food and make sure to check it regularly to make sure it’s not expired. You should also have enough water for your pets as well as your human family members. And don’t forget to pack food and water dishes. Medication- If your pet is on medication, make sure you always have at least a week’s supply and that it’s not expired. If your pet’s medication needs to be refrigerated (like insulin) have a cooler to pack it in. You should also have a basic pet first aid kit and a copy of your pet’s medical records. A carrier/extra leash and collar- It’s important that you’re able to transport your pet in a safe and controlled manner. Get your cat used to his carrier so that you can get him into it quickly in case of an emergency. A litter pan and litter for your cats and bags to dispose of your pet’s waste. Rescue alert stickers are an easy way to notify rescue workers of your pets’ presence. These stickers should be filled out with the names, number and types of pets that live in your home. They should also have your veterinarian’s name and phone number should they require medical attention. Place the sticker where it will be easily visible (ie. on or right next to your front door). If an emergency occurs and you are able to evacuate your pets on time and it is safe to do so, write “EVACUATED” on the sticker so that rescue workers know your pets have been safely removed from the premises. We all like to think it will never be us. But the truth is, disasters happen to some degree, to all of us. When the bad stuff happens, a little preparedness can go a long way to making sure every single member of your family stays safe.